This is obvious when you make the Bread Bible crumpet batter which, for me, was more like a loose bread dough. It certainly didn't 'pour' into the crumpet rings. I used the scalded milk option for liquid in this recipe instead of the alternative low fat milk powder and water. I'm not sure if this affected the density of the batter also. The good news is that despite the slightly more bready than crumpety texture of the crumpets they were extremely tasty (straight out of the frying pan with bit of butter). This is an extremely easy recipe (liquid issues not withstanding) requiring only patience while the batter proofs a couple of times. This post was a catch up (I'm in perpetual catch-up) for Rose's Bread Bible baking group. Have a look at the main baking group website to see how the others are going. I've made the January Traditional Challah (post coming soon) and am next on to February's Spiced Herb Breadsticks. Crumpets are so confounding! Elle and I are on to the breadsticks, as well, so it seems we will play catch up together. I know! 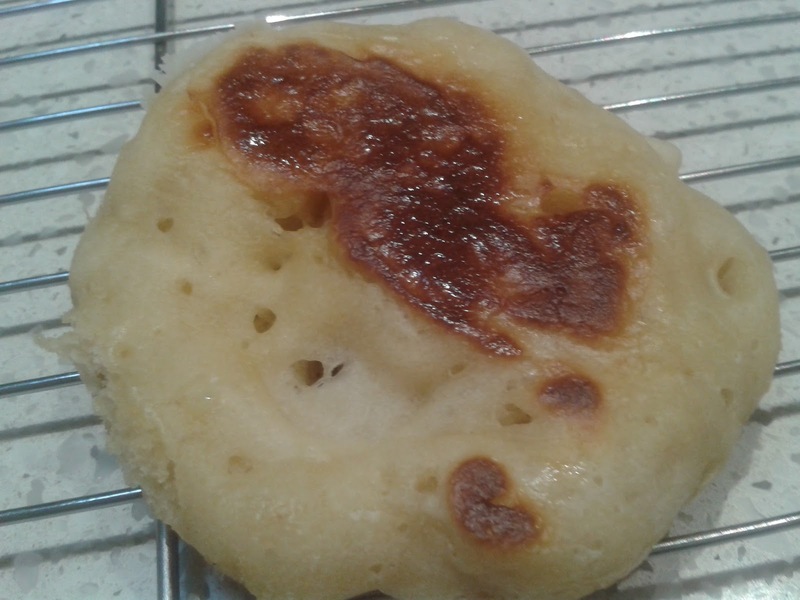 I just looked at the photo in the Bread Bible and Rose's crumpets don't look like moon rocks (i.e. mine). Elle's breadsticks look great so I'm quite looking forward to getting out the pasta machine.